Len asks, I have just converted to cable phone service : Is there away to hook up a battery back up; connected to a land line in case of a power failure? One of the many things that get shoved under the carpet when VoIP providers talk up great features like no long distance costs is disaster planning. In the landline world of simple phones, the power could go out and your phone would still work. When the power goes out for a VoIP customer, it takes out the cable modem, which kills the Internet connection, which effectively makes the phone useless. For brief outages this might not be a big deal, but what happens when your power is out for several hours? You need a backup plan. My primary backup plan is my cell phone. I have a call blast setup with Vonage (my VoIP provider) to automatically ring the phone at my house and my cell phone. I get calls no matter where I. If the power goes out, my cell phone battery is generally lasts long enough to endure most common power outages. In the event of a longer power outage, I can always recharge the phone from my car battery or plug in at the local coffee shop while I have a beverage. If you don't have a cell phone, a different type of backup plan is in order. The easiest backup to configure for a VoIP service is a uninterrupted power supply (UPS). These are readily available in a variety of battery sizes at the local electronics store or you can find more serious solutions online. The trick is finding one that lasts long enough for your disaster preparedness comfort zone. The consumer level units are generally only good for about two hours. You might be able to get more than two hours of life for reasonably power efficient devices like a cable modem and VoIP adapter. While you might need a phone within a two hour window, that's still not real protection. If you want to keep your phone online while the power is out, a minimum of 24 hours seems more like a reasonable backup timeframe. Using the APC UPS configuration wizard. Since they change models as battery technology improves, it's useful to step through the process to identify the battery backup solution that will solve your specific power protection needs. Keep in mind that keeping all the pieces of your VoIP system online is significantly more expensive than paying for a bare bones landline with no features. This is one of the things that's worth weighing before dumping your landline in place of something else. Another option would be to install a gas powered backup generator in a shed behind your house. 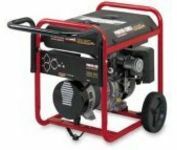 A generator with enough horsepower to support most of your house for a half day on seven gallons of gas costs under $1000. If you ration the power, it might last longer. Ultimately your decision should be based entirely on your own comfort level. I never lose sleep relying on my cell phone in case of emergency and I also have a battery backup to protect my computers in case of short term power failure, in part to protect my data. If I didn't have a cell phone as a backup, I likely would still have a traditional landline as my primary phone because the phone company is generally reliable and their service works through localized power outages. Is VoIP the Right Solution for You?